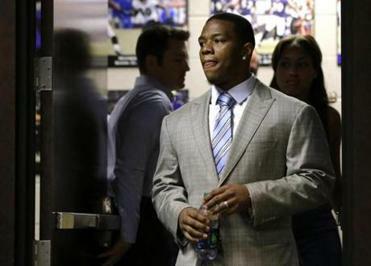 BALTIMORE (AP) — Ray Rice was let go by the Baltimore Ravens on Monday and suspended indefinitely by the NFL after a video was released showing the running back striking his then-fiancee in February. Only after new video evidence emerged was justice served in the case of the former Ravens running back. The Ravens had used words like ‘‘respect’’ and ‘‘proud’’ in referring to Rice following his arrest. Ravens coach John Harbaugh said Monday night that he had not seen the video before today. “It wasn’t something we ever saw, never had access to,” he said. A day after Harbaugh’s comments, Rice acknowledged in a news conference that his actions that night were ‘‘inexcusable.’’ But the Ravens never took action against him until after the second video was released.